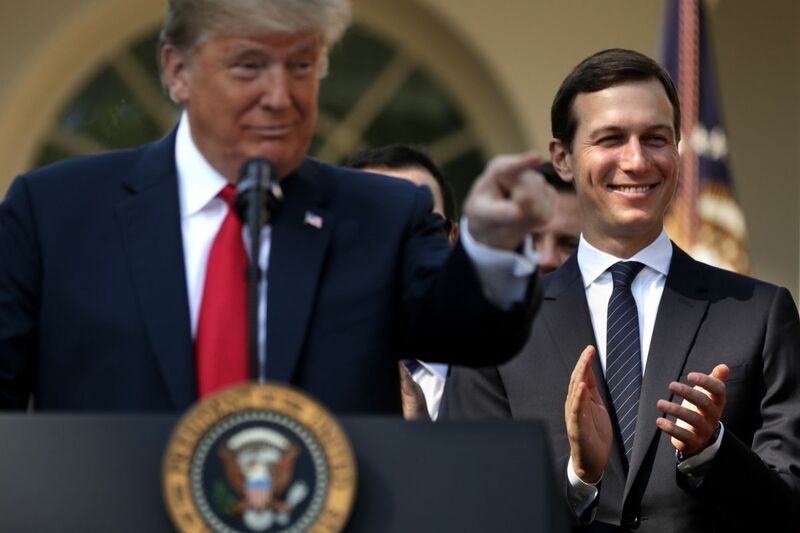 Jared Kushner reportedly wants President Donald Trump to stand by Saudi Arabia despite the likely murder of journalist Jamal Khashoggi. Jared Kushner reportedly told President Donald Trump to stand by Saudi Arabiaâs Crown Prince Mohammed bin Salman â" despite mounting evidence that the royal was involved in the murder of journalist Jamal Khashoggi two weeks ago. Kushnerâs reasoning? International outrage over other incidents, like Saudi Arabiaâs bombing of innocent children in Yemen and kidnapping of Lebanonâs prime ministe r, decreased with time. The scandal over the disappearance of Khashoggi, a US resident and Washington Post writer, would similarly go away, he argued. Thatâs one of the more jarring tidbits in a Thursday New York Times report, which also notes that Riyadh plans to blame a Saudi intelligence official â" Gen. Ahmed al-Assiri, who is close to the crown prince â" for Khashoggiâs murder. A source close to Kushner, however, told CNNâs Jake Tapper the story is inaccurate. As of now, itâs still unclear what, exactly, happened to the Saudi journalist or who is responsible. But some reports indicate that Khashoggi was beaten, killed, and posthumously dismembered inside Istanbulâs Saudi Consulate on October 2. Turkish authorities are searching for his remains in wooded areas outside of Istanbul. Trump told reporters on Thursday afternoon that it âcertainly looksâ like Khashoggi is dead, and vowed âsevereâ consequences if Saudi royals were behind the possible killing. To a certain extent, Kushner is correct â" public attention did shift from the recent Yemen tragedy and Saad Haririâs kidnapping, although they have since informed the realization that Mohammed bin Salman, also known as MBS, is a reckless autocrat. But whatâs notable here is that Kushner doesnât want the US to respond to Khashoggiâs alleged murder in any way. He simply wants America to forget the incident ever happened. Thatâs perhaps not so surprising. Kushner has cultivated a personal relationship with MBS while serving as senior White House adviser for Middle East affairs. He and the crown prince even text on WhatsApp, an encrypted messaging app. Because of his close ties to the Saudi royal, Kushner has purposely stayed out of the spotlight during the scandal. But for MBS, the news is another reason to stay in close contact with Trumpâs son-in-law. The royal once bragged that Kushner was âin his pocket,â and the New Yor k Times story will likely only add to that perception. Secretary of State Mike Pompeo on Thursday told reporters that the administration will give Saudi Arabia a few more days to conduct a probe into what happened to Khashoggi. Itâs doubtful the investigation will be an impartial one, or that MBS â" who US intelligence says knew about the Khashoggi plan â" will be held responsible. Thatâs all well and good for Trump, who has shown no real appetite for imposing huge costs on Riyadh. The president has said repeatedly said he doesnât want to take any actions that could imperil a litany of arms sales to Riyadh that could total $110 billion. Whatâs more, he has noted that Khashoggi was a US resident, but not a citizen, therefore suggesting that his disappearance and alleged murder didnât merit a stern response from America. However, Treasury Secretary Steven Mnuchin on Thursday wi thdrew from a big Saudi conference scheduled for next week â" the only official rebuke of Riyadh since Khashoggiâs disappearance. So Kushnerâs advice to Trump is probably exactly what the president wants to hear. That doesnât make it any less horrifying. Trumpâs âcaravanâ tantrum could put migrants in danger. Just look at what happened to the last one. I support affirmative action. But Harvard really is hurting Asian Americans.